Zion Market Research has published a new report titled “Automotive Lubricants Market by Product (Gear Oil, Transmission Fluid, and Engine Oil) and by Vehicle Type (Light-weight Commercial Vehicle (LCV), Passenger Car (PC), and Heavy-weight Commercial Vehicle (HCV)): Global Industry Perspective, Comprehensive Analysis, and Forecast, 2017 - 2024”. 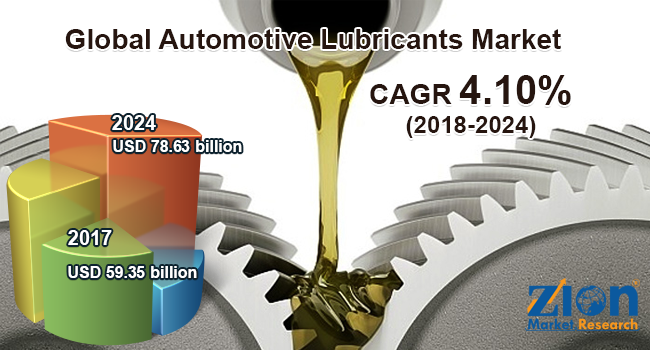 According to the report, global automotive lubricants market was valued at approximately USD 59.35 billion in 2017 and is expected to generate revenue of around USD 78.63 billion by the end of 2024, growing at a CAGR of around 4.10% between 2018 and 2024. Lubricants play a major role in the industrial and commercial sectors which includes aviation, automotive, manufacturing, and marine. An automotive lubricant helps in cooling of the components and also in debris removal. Automotive lubricant offers one of the significant features called viscosity; it is the capability of the fluid to stand firm against the motion. Increase in the automotive industry across the globe has resulted in rising demand for the automotive lubricants market. Rising consumer preference towards the high quality synthetic automotive lubricants is a major factor driving the growth of the market. Additionally, the increase in the stringent environmental rules and regulations leads to the adoption of high-quality lubricants by vehicle owners which further tend to positively impact the automotive lubricants market during the forecast period. On the basis of product, automotive lubricants market is fragmented into gear oil, engine oil, and transmission fluid. Engine oil accounted for the largest market share in 2017. The trend is anticipated to continue during the forecast period. Engine oils help in reducing the friction generated due to the metal-to-metal contact inside the engine and also remove the impurities in the fuel. Engine oil contributes in keeping the engine cool, prevents corrosion, and cleans engine. Several major market players are involved in manufacturing engine oils with higher performing additives. North America is the largest market for engine oil lubricants. Based on the vehicle type, the market is divided into the light-weight commercial vehicle, passenger car, and heavy-weight commercial vehicle. Passenger car accounted for a major market share in 2017 and is anticipated to continue its dominance during the forecast period. Based on the region, Asia Pacific dominates the overall automotive lubricants market. The growth is accredited to the increase in disposable income in countries such as India and China which resulted in rising demand for passenger vehicles and commercial vehicles. Europe and North America are anticipated to show a considerable growth rate during the forecast timeframe. Increasing demand for synthetic lubricants coupled with rising customer preference for high-quality lubricants is the major factor driving the market growth in this region. However, the Middle East & Africa automotive lubricants market is anticipated to witness a moderate growth. Some of the most important market players in the global automotive lubricants market are BP Plc, Royal Dutch Shell, Idemitsu Kosan Co. Ltd., Valvoline, Chevron, ExxonMobil Corporation, FUCHS Lubricants, Chevron Corporation, BASF SE, Lukoil Oil Company, Sinopec, PetroChina Company Limited, and Indian Oil Corporation Ltd.